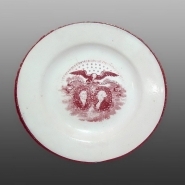 Shown here is a second version of this pattern without the molded and painted border and, in its place, with a simple enameled rim. A 6.37 inch earthenware molded and printed plate. The pattern, printed in red, features the portraits of La Fayette and Washington. The border is molded and painted with alternating flowers and leaves. ca. 1824-1825. The underside is marked with an impressed "18" and four green enamel dots forming a diamond shape.